Because of the popularity of electronic technology, the ability to do comparison pricing and the ease in ordering on-line, consumers are purchasing more products from the Internet than from brick-and-mortar stores according to "New top choice for shoppers: Online overtakes brick-and-mortar." But, not all products sell well over the Internet because consumers still want to see certain products before purchasing them so that they can examine them or in the case of clothing try them on. However, decorative flags seem to be a product that has no trouble selling in e-stores because there is a multitude of stores on the Internet. For artists, it is informative to learn what type of art the consumer purchases so getting input from store owners are very important. And, we are very fortunate that Becky Bennett owner of one of the leading flag e-stores "Flags On A Stick" has shared her knowledge and perspective in the following article about the decorative flag industry. I started flagsonastick.com in 2001 for two reasons: 1) I love decorative flags and I was frustrated with the lack of flag stores in my home state of Minnesota, and 2) I wanted to have a store at the Minnesota State Fair, which is known for its abundance of food and other unique items “on a stick”. Thus, the quirky name Flags On A Stick. Note: Read more about Becky at the bottom of this article. Decorative flags have come a long way in those 13 years. I like to say, "These are not your grandmother's flags anymore". The colors are more vibrant and the fabrics are more luxurious, as well as more durable. Fabrics have really improved in the last two to three years, featuring silky soft texture which allows flags to drape and hang better. Printed flags now sell better than appliqué flags, which was not the case when I first started my flag store. The printing technology has greatly improved, enhancing the overall appearance of outdoor flags. Printed decorative flags now have detailed backgrounds and borders, plus vivid colors with more dimension which helps brings the artistic details to life. The newest printing technology now allows printed text to read correctly on both sides of the flag, which my customers have been begging for. This feature is often called 2-sided message or double-sided or double talk. On my website, I designate this feature by stating 2-sided message in the product title, as well as adding an icon to the flag which appears once you click on the flag. This icon alerts my customers that this flag is one that reads correctly on both sides. Flag Trends by Carson Home Accents has really raised the bar for 2-sided text flags, making it a standard feature on all their house and garden flags. Their flags also include glitter accents. Flag Trends does a good job of licensing artwork from a variety of artists. They don't just stay with the same artists year after year. Breeze Art is also another great flag manufacturer known for their variety of licensed artwork by nationally known artists. Magnet Works is the parent company of Breeze Art flags, Mailwraps mailbox covers, MatMates doormats and Yard DeSigns address signs. They are the leader in providing matching flags and other outdoor garden décor featuring artistic designs created by a variety of artists. Many of my customers like to purchase the entire collection to decorate from curb to door with a seasonal or holiday theme. My contacts at Accent Home & Garden by Premier have stated in the future they are hoping to offer more licensed artwork, which is great news. Evergreen has innovative flags with LED lights. I personally think Evergreen has the best appliqué flags in the industry. The appliqué flags have silky soft fabrics and usually have nice large images with artist detail, plus added surprises such as glitter and streamers. Toland is also another manufacture who provides a variety of decorative house and garden flags. Decorative outdoor flags that sell the best are the ones that have larger images and unique art that adds a “pop” of eye-catching color. Whether it's an adorable snowman or charming Easter Bunny, the image has to be large enough to be seen when it is displayed on a home or in the yard. The flags that don't sell as well have backgrounds that are “busy” and detract from the main theme or subject of the flag. Flags that have text in pretty fonts also sell well.... especially flags that say "Welcome". After all, decorative flags really do welcome friends and family to your home. Adding charming artistic elements such as birdhouses, or pretty borders and backgrounds provides that eye-catching detail that my customers love. Popular trends and themes vary for each season and holiday. Snowmen, Santas and poinsettias sell well for winter and Christmas. I had many customers last year comment that they wished more flags said “Merry Christmas” rather than “Happy Holidays”. The flag industry responded well to this request with many of the 2014 Christmas flags having “Merry Christmas” written in lovely script. My customers will be so pleased. I must say that snowmen sell better after Christmas. After the holidays, that Santa flag looks silly and has got to come down. Snowmen are perfect for the entire winter season. Valentine’s Day flags have really jumped in popularity in both the garden and house size flags. Cardinals and chickadees sell well all year long. Patriotic themes also sell well all year long, so I always keep red, white and blue patriotic flags in stock, as well as several birthday flags. Owls are still popular for all the seasons and holidays. My experience has been that whimsical owls, frogs and bunnies sell better than realistic art images. Flowers and garden scenes are always popular. My best sellers are decorative garden size flags, which measure 12.5” x 18”. They are inexpensive garden décor that has continued to sell well even during our tough economic times. Retail price is usually $10 to $11. House size flags are the next best sellers, measuring 28” x 40”. Mailbox covers and doormats have continued to sell well and certainly have a strong following for those who like matching sets. I believe customers choose their decorative flags based upon the artistic design, first and foremost. The theme, design and color combinations have to appeal to them. They also look for specific artists whose flags they’ve purchased in the past. There are flag artists such as Susan Winget and Jennifer Brinley who have been around since the start of my flag store. However, I am seeing newer artists, including Robbin Rawlings, Victoria Hutto, and Robin Pickens whose designs are selling well. The more variety the better to keep customers coming back for more. I have customers all across the US and Canada, as well as Europe. The coastal states seem to have the most flag-waving customers. Because I sell all across the country, I find it interesting to watch the seasonal flag sales. For example, spring arrives so much sooner in the southern states. So flags with spring themes thus start selling sooner than they do here in Minnesota, where it may not seem like spring until late April. Flag customers are people who enjoy gardening, nature, and being outside. They often purchase other garden décor to add colorful accents to their yard and home. Variety is key for the flag industry. Offering everything from whimsical to more sophisticated, elegant designs keeps existing customers coming back for the newest flags and encourages new people to start their flag collection. My customers love to sneak a peek at the latest designs. I keep them up to date via email newsletters regarding new arrivals, as well as Featured Artists on my blog. I created the monthly Featured Artist segment because I thought my customers would be interested in knowing more about the artists behind the flags. Being a Featured Artist on my blog has really helped my customers become more familiar with various artists and their designs. It has also helped sell their flags. 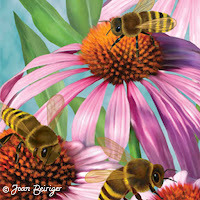 I feature the artist’s other products on my blog and Facebook, giving them more exposure. My customers enjoy getting to know the artists and love engaging and adding comments on Facebook. If you have licensed your art for decorative flags and you’d like to be a featured artist, please contact me. My customer base is getting younger, which is good news for artists and for the flag industry. Flags remain a strong garden décor item. I live in Minneapolis, MN. In my “other life” I owned a court reporting firm and was a court reporter for 11 years. After our third child was born, I stayed home to raise our children. Flags On A Stick was an idea I had to start a seasonal store at the Minnesota State Fair. I LOVE my job. I love getting the new flag catalogs from the manufacturers, meeting with the sales reps to hear about the latest trends, getting to know the artists, and selecting the newest designs for the upcoming seasons and holidays. I’m fascinated by the technology involved in running an e-commerce business. I enjoy taking orders over the phone from customers who’ve shopped with us for over 13 years. I’m so fortunate that all my adult children and two grandsons live nearby. Golfing with friends and fishing with my husband and children are my favorite things to do. Although it is not up-to-date "Licensing Art to the Flag Industry" has important information about the decorative flag industry.